Our Ultra IC00P GS6 are Instrument Patch Cables made with Canare GS-6 instrument cable and come standard with your choice of 1/4" plug options. This cable offers Bass players, Guitar players and Keyboards clearity in the upper register with more high end presence and greater clearity. There is still all the bottom end you want just with better clarity. This is a very natural, transparent. 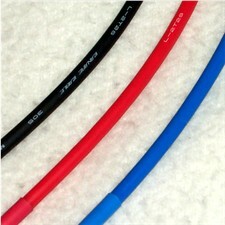 You can choose between Black, Blue GS-6 colored cable.